My first time at IKANOS was hard to beat. It was also for the Montréal en lumière festival, but during dinner. It was an immersive sensory excperience as both food and wine pairings matched the mysterious and exotic light show of artist Laurent Lamarche. The art was truly captivating. As Celophane creatures on board an old school projector danced about to twicthy electrical pusles, a light show of tropical blues and greens painted the white brick wall. As far as decor goes, IKANOS already has done an excellent job with their ambiance. A big lofty space, with carefully curated accents like destroyed columns and furry chair tops. One never gets bored if Chef Constant is present. A jovial and authentic comedian who treats his customers like family. Today’s IKANOS experience, another trip entirely. 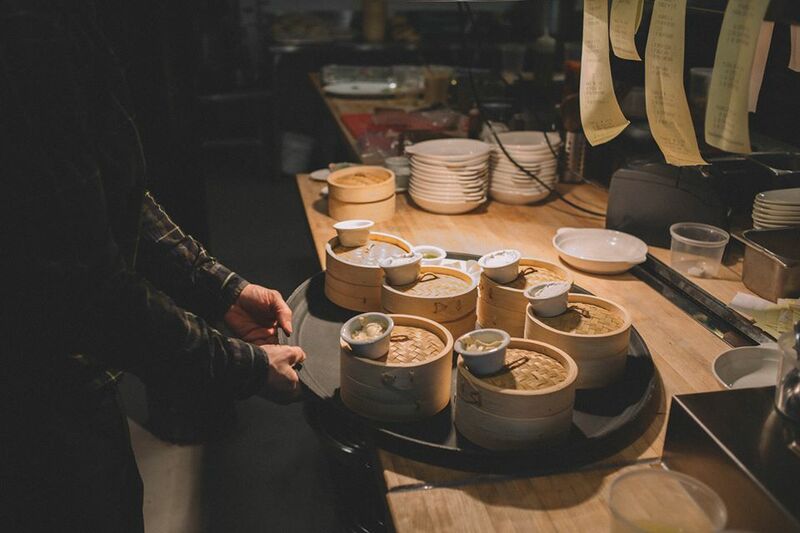 A unique spin on Dim Sum brunching for every style of foodie. There were the traditional pork and shrimp dumplings and sticky buns, and really delicious surprises like the fried mushroom dumpling with parmesan cream. Let’s talk about parmesan cream for a moment. YES. Basically you want to learn how to make it so you may spread it on everything in your fridge. No brunch is complete without a benney decision (mine was crab) and mimosas. Mine was mango and my guest Mykael Banks was delighfully surprised to land on a Campari mimosa. This to his utter delight as his fave poison is in fact the Negroni. These fruitful and dry beauties brought out the delicate herbs of the dumplings and cut the oils and flavors between dishes. Dessert was a dive into donughty dimensions of pure doughy sugary yum. My fave tongue trooping however was the subtle orange blossom aioli paired with the pork and crab steamed dumpling. Bref, I shall return to IKANOS again and again. 3 – Minute Chocolate Mousse | It’s got BOOZE in it!